In July, we found ourselves on the other side of the pond at the site of a tennis Grand Slam, and for August we travel back to the States and check out the site of the annual University of Colorado (CU) – Colorado State University (CSU) football game, Sports Authority Field at Mile High (called Mile High from here on out) in Denver. 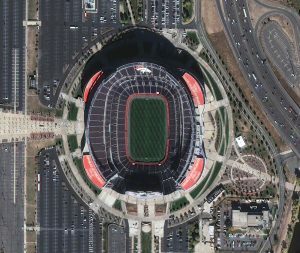 A 50-cm color image of Sports Authority Field at Mile High in Denver, Colorado, USA collected on October 20, 2016 by Pléiades 1A; and then a 1.5-m SPOT 7 image of the same stadium even collected on the same day! These images have custom processing and color balancing applied by Apollo Mapping. PLEIADES © CNES 2018, Distribution Airbus DS. SPOT © Airbus DS 2018. Name & Its Origin: Before the great rush to move to Colorado started, the Denver Broncos called Mile High Stadium home, but in 2001 that all changed when they moved into their new stadium. Originally called Invesco Field at Mile High as part of a 20-year naming agreement worth $120 million, in 2011, Sports Authority bought the last 6 years of the naming rights as Invesco skidded into financial troubles. Well in 2016, Sports Authority went bankrupt but their name remained on the side of the stadium until January 2018 when it was removed. The Broncos plan to have a new naming partner before 2018 Spring Training starts. Location: Mile High is located in the heart of our mile-high city, Denver, Colorado, just west of the downtown corridor. Perched at about 5,200 feet above sea level, when sitting inside the stadium you can see the mountain peaks of the Rockies jutting up about 11 miles (17.5 kilometers) away. Stadium Capacity/Size, Architect & Build Date: Designed by HTNB and built by Turner Construction, Mile High cost about $400.7 million in the end, opening in time for the 2001 football season on August 11th. In 2016, there was talk of a $16 million renovation plan that could start in 2020 but it is unclear if these plans are still moving forward. There was also talk of a 50-acre mixed use re-development of the south parking lots around Mile High, which as a Coloradan sounds like a good idea to renovate old, unused space in the heart of the city. The football stadium currently seats some 76,125 screaming Broncos fans. Type of Field Surface: Mile High features a natural Kentucky Bluegrass field with a Desso Grassmaster stabilization system below. The Grassmaster system features millions of tiny artificial fibers that are injected into the soil at a depth of about 8-inches – as the natural grass grows, the roots are entwined around the fibers thereby creating a more stable playing surface. Key Sports Teams: As you might have guessed, Mile High is all about the Denver Broncos who last won the Super Bowl a few year ago in 2015. That said, they do host a variety of events at Mile High, including Major League Lacrosse games (i.e. the Denver Outlaws), concerts such as Kenny Chesney and the Global Dance Festival this summer and even college football matchups. Most Popular Yearly Event: Without question, the most popular events at Mile High are the eight yearly Broncos’ home games. Most years, the Broncos sell out every home game, for example in 2017 where the average attendance was fifth best in the National Football League (NFL) at 76,355 or 100.3% of capacity. Fun Factoids: (1) On August 31st at 7:30 PM Mountain time, the 90th edition of the Rocky Mountain Showdown between CU and CSU will kickoff! It is the 18th time the showdown has been played in Denver with CU owning an 11-6 edge over CSU in those games. (2) Mile High covers some 89 acres with 1.717 million square feet of indoor space, 7,500 onsite parking spaces and 12,000 offsite spaces. (3) The old Mile High stadium featured metal stands that swayed and rocked when screaming fans jumped on them. In the new edition of the stadium, they tried to recreate the Rocky Mountain Thunder with 13,500 tons of steel risers spaced throughout. (4) Bucky or Bucko is a 27-foot tall, 1,600 pound statue that has reigned over Mile High since 1975 – it was refurbished after the last home game in the old Mile High, making its triumphant return on August 11, 2011. 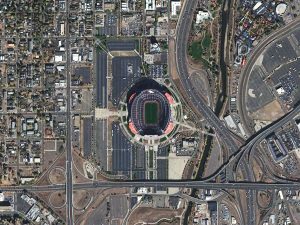 This entry was posted in The Geospatial Times and tagged Colorado, Denver, featured products, Mile High Stadium, Pléiades 1 Stadium of the Month, SPOT 6, SPOT 7, The Geospatial Times by Apollo Mapping. Bookmark the permalink.